I read this article and found it very interesting, thought it might be something for you. 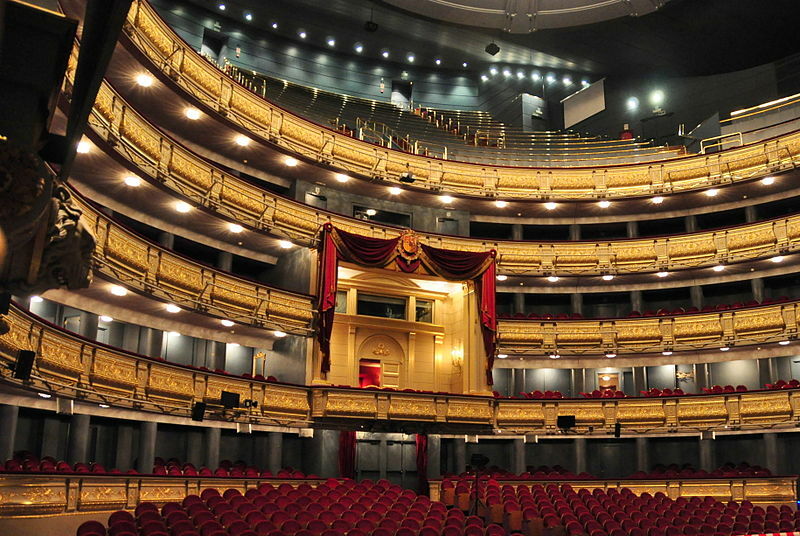 The article is called 10 Things to Know about Madrid Cathedral and is located at http://trip-n-travel.com/listicle/14967/. Spain is a country full of amazing historical sites, particularly cathedrals and churches of all styles from throughout history. 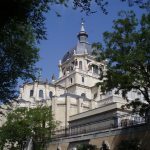 The Cathedral of Madrid (Santa Maria la Real de la Almudena) is certainly worth a visit if you happen to be spending some time in the capital city. Construction of the cathedral did not start until 1879, relatively late considering King Felipe II in 1561, began discussions for the building of a cathedral in the new capital. The cathedral was designed by Fransisco de Cubas. The building work had to cease during the Spanish civil war and was actually entirely abandoned until 1950 and not completed until 1993. It is the only Spanish cathedral to be consecrated by a Pope (Pope John Paul II). The Cathedral of Madrid is unusual compared to other cathedrals in Spain in that it’s design embraces a mixture of architectural styles. 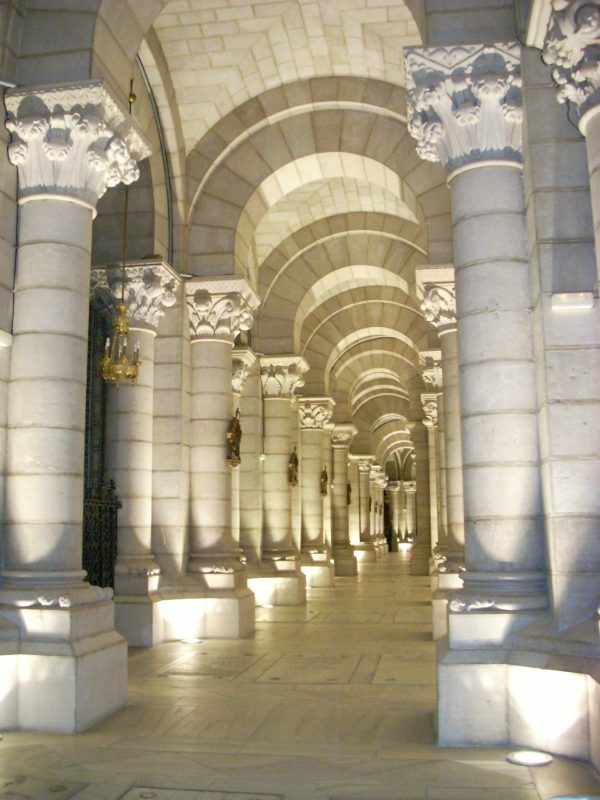 Constructed of granite and marble, it has a Neoclassical exterior, a Gothic revival interior and a Neo-romanesque crypt. The interior has a distinct modern feel with sculptures and chapels of contemporary artists. 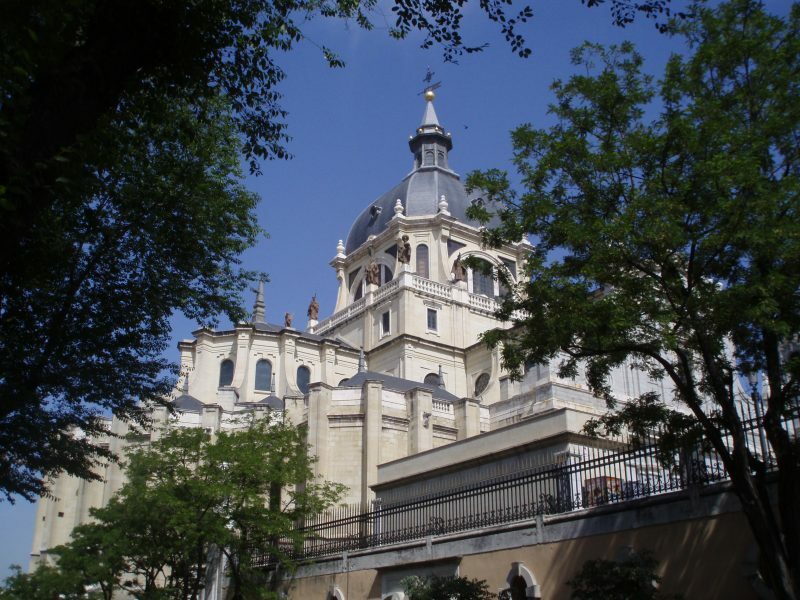 The site where the cathedral was built was originally home to the first mosque of Madrid, and subsequently by a church dedicated to the patron saint of Madrid, the virgin of Almudena. The cathedral is now consecrated to Santa Maria de la Almudena (a name with Arabic origins). Al Mudayna means the castle. 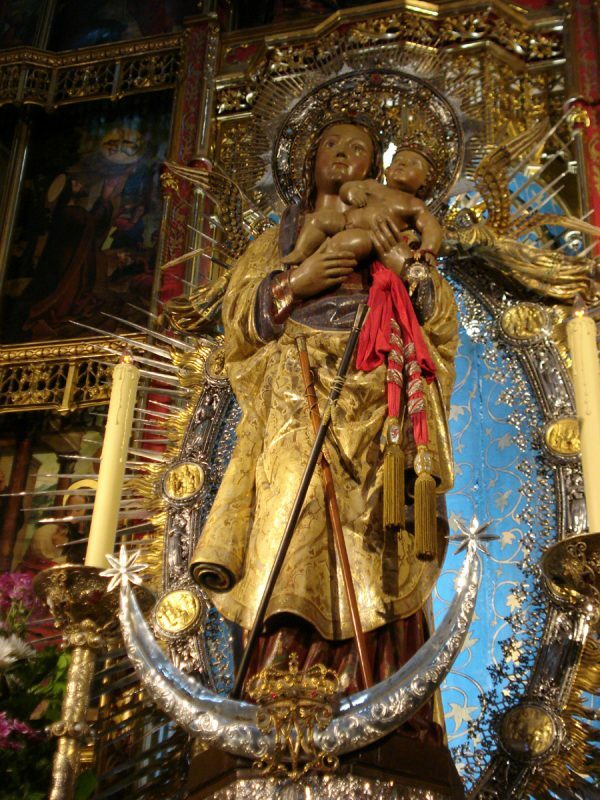 Some say that in the 8th century, when the moors invaded the fortress that is now the site of the city of Madrid, the Spanish people hid an image of the Virgin de la Almudena inside the walls. Only during the 15th century, in the reconquest of the city was the picture found as a wall crumbled to reveal the image of the virgin. In May 2004 Prince Felipe married his wife Letizia in the cathedral, an elegant and impressive event for the country and giving the cathedral some wide publicity. The Neo-Romanesque crypt is the oldest part of the Cathedral, built in the 19th century. This is where you can find a 16th century antique portrait of the Virgin de la Almudena. Within the crypt are the remains of Moorish an medieval city walls. The cathedral is located adjacent to the Royal Palace, with the wide plaza separating the two buildings. It’s unusual in that it was built to face north and south (rather than east and west as most other churches and cathedrals). 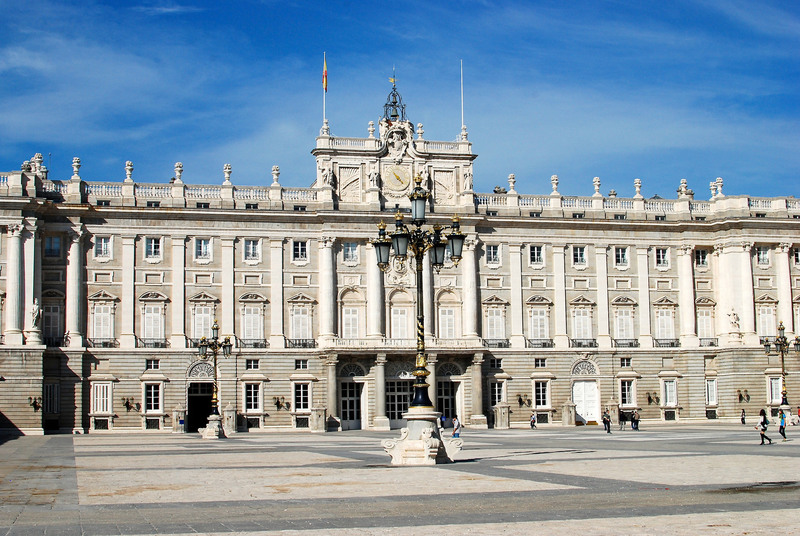 This is due to the fact that it was originally designed to be part of the Royal Palace complex of buildings. It is the largest cathedral in Spain, measuring 104 m long and 76 m wide. It’s central dome has a diameter of 20m. The cathedral is well known for it’s modern artistic style. In the Blessed Sacrament Chapel you can find a mosaic from well-known artist Fr. Marko Ivan Rupnik. In the apse are many painting by Kiko Arguello (all of which have been blessed by the arch bishop of Madrid). The museum is worth a visit to understand better the history of the church and the archdiocese of Madrid. It’s nice to end the trip up at the dome taking in an awe inspiring view over Madrid.